1966 - While living in Weybridge, Julian brought home a watercolor drawing (pictured to the right) from Heath House Infants' School. Julian recalls..., "I was trundled home from school and came walking up with one of my watercolor paintings. It was just a bunch of stars and this blonde girl I knew at school. And Dad said, 'What's this?' I said, 'It's Lucy in the sky!'" This became the inspiration for the Beatles tune Lucy in the Sky with Diamonds. 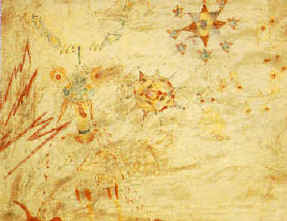 Later, another of Julian's drawings was used as the cover to the Beatles's Christmas Time is Here Again album. 29 August 1966 - The Beatles perform their last public concert at Candlestick Park in San Francisco, California. 9 November 1966 - John Lennon is introduced to Yoko Ono at the Indicia Art Gallery.